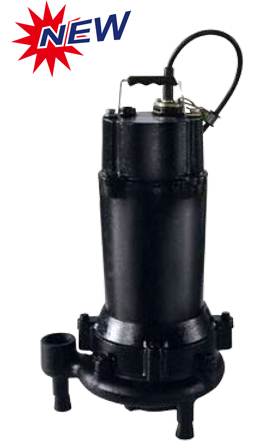 FGC Grinder Pump, non-clogging design, small discharge, and high pressure, ideal for individual residential and low-pressure sewer applications. Outlet – 32 mm (1-1/4 in.) or 50 mm (2 in.). Max. head – up to 52 m / 171 ft.
Max. flow – up to 370 l/min / 98 gpm. Oil-free motor, class F, IP 68, with thermal and over-currentprotector. Dynamic balanced cast iron impeller. Rigid grinding device – high chrome steel chopper andchopper ring with hardness of 55 – 58 Rockwell C.
Standard cable length – 10 m (33 ft), or longer upon request. Guide rail fittings are available upon request.